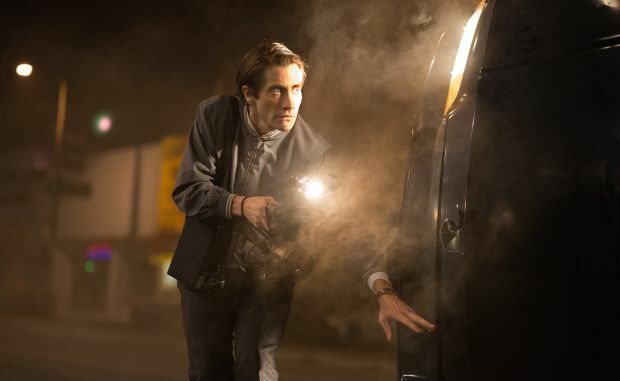 NEW YORK (CNS) — The free-for-all world of local TV news reporting provides the backdrop for the strikingly creepy character study “Nightcrawler” (Open Road). Though it showcases a memorable — if unsettling — performance by Jake Gyllenhaal, writer-director Dan Gilroy’s drama also features a gritty urban atmosphere pervaded by an air of moral nihilism. It thus calls for thoughtful assessment by mature, well-grounded viewers. Gyllenhaal plays Lou Bloom, a borderline-autistic Los Angeles loner scratching out a bare-bones existence through the nonviolent theft of items like scrap metal or an unattended racing bike. Accidently exposed to the work of the breed of ambulance-chasing cameramen whose disdainful nickname gives the film its title, Bloom takes up the seamy craft — and discovers that he’s quite good at it. Mainly, that’s due to the fact that he displays a total disregard for any semblance of ethical standards. The more gruesome the images he can intrusively videotape at the site of a car wreck or on the scene of a violent crime, the better. In fact, Bloom’s indifference to the suffering he captures brings him so much success that Nina (Rene Russo), the producer of the show to which he markets his sensationalist wares, becomes dependent on his output to maintain ratings — and thereby keep her job. Since Bloom is attracted to the considerably older Nina, the power he wields over her leads to some queasy exchanges in the dialogue. With his fortunes in the ascent, Bloom hires homeless drifter Rick (Riz Ahmed) to serve as his assistant and sidekick. But his proximity to Bloom eventually reveals to Rick just how dark the hidden depths of his employer’s obvious eccentricity are, an insight that leaves him not only repelled but alarmed. Gyllenhaal’s Bloom is mesmerizingly off-kilter, utterly tone deaf to the social cues of those around him and delusionally pretentious. Addicted to the kind of bromides that might be overheard at a particularly woeful team-building retreat, he is nonetheless genuinely driven to succeed, and to do so at any cost. Via Bloom’s disturbing antics, Gilroy adeptly satirizes both yellow journalism and the public hunger for tabloid images that fuels its excesses. But as Bloom’s initial moral sketchiness leads on to more sinister wrongdoing, distance and discernment are required to resist treating his descent as a giddy vicarious ride into amorality. The film contains considerable, often gory violence, several uses of profanity, brief but coarse references to sexuality and pervasive rough and crude language. The Catholic News Service classification is L — limited adult audience, films whose problematic content many adults would find troubling. The Motion Picture Association of America rating is R — restricted. Under 17 requires accompanying parent or adult guardian.